~Carefully mix together graham cracker pieces, chocolate bar pieces, miniature marshmallows and marshmallow creme in large bowl. 1. Heat oven to 350°F. Grease large cookie sheet or jelly-roll pan. 2. B eat butter and sugar until light and fluffy in large bowl. Add egg and vanilla; beat well. Stir together flour, graham cracker crumbs, baking powder and salt; add to butter mixture, beating until blended. Press dough into prepared pan. Bake 15 minutes. 3. Meanwhile prepare S'MORE TOPPING. Evenly spread topping mixture over partially baked cookie crust. 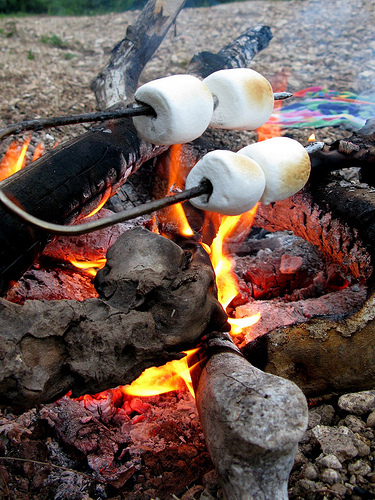 Bake additional 15 to 20 minutes or until marshmallows are lightly browned. Cool completely in pan on wire rack. Cut into bars. 4. Serve as bars or warm bars slightly and serve with ice cream. 15 servings.